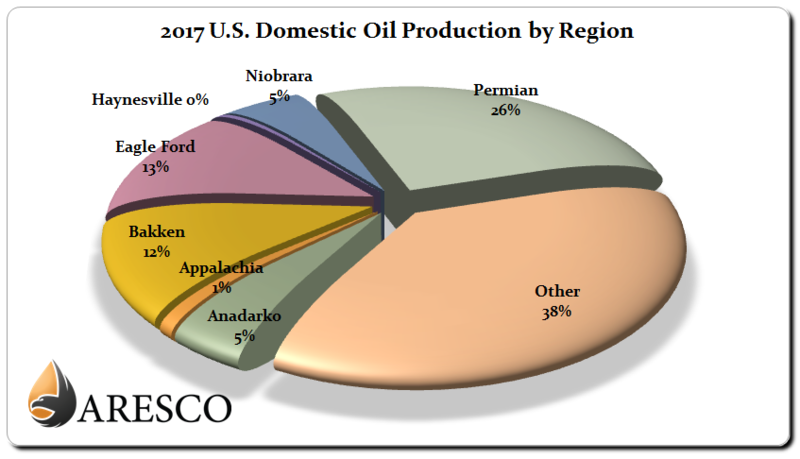 In 2017, the Permian Basin dominated U.S. crude oil production, accounting for over a quarter of all domestic crude oil production. Crude production in the Permian Basin in 2017 was approximately 2,444,438 barrels per day, which amounted to 26% of the 9,319,526 barrels per day of total U.S. crude production. The Eagle Ford shale region came in a distant second in domestic crude production, accounting for 13% of total U.S. production at 1,182,513 barrels per day. The Permian Basin and Eagle Ford combined accounted for almost 40% of all U.S. crude oil production.